A day after tomorrow, FIBA Asia Cup 2012 is all set to start the Quarterfinals game. Only four teams from each group (A and B) are qualified to play in quarterfinals in order to be one of the four teams in the semifinal rounds. From group A, the teams are Philippines, Lebanon, China and Uzbekistan, while group B are, Japan, Iran, Qatar and Chinese Taipei. Today, is the last game before the FIBA Asia Cup 2012 Quarterfinals. You may see below the Game Schedule for today - September 18, 2012. 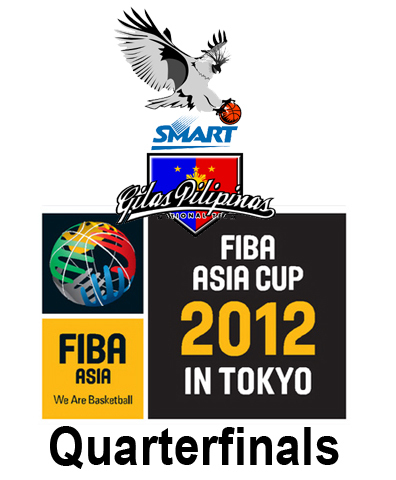 Here's the FIBA Asia Cup 2012 Quarterfinals - September 20, 2012. Smart-Gilas II successfully make it to the quarterfinals, they really gave their best in this tournament. Let us all support our very own Philippine team, you can share this post to your friends on Facebook, Twitter and Google+ so everyone will know about this FIBA Asia Cup 2012. Comments or suggestions about "FIBA Asia Cup 2012 Quarterfinals September 20, 2012" is important to us, you may share it by using the comment box below.